Playa del Carmen weddings don't need to be stressful, at Mahekal Beach Resort our attentive staff will guide you through every step of the event planning process. Each member of our team offers unique expertise for planning weddings in Playa del Carmen and can help you to select the perfect local entertainment and decor. Whether you need to reserve a room block for your guests in our newly revitalized accommodations or are seeking to craft the perfect catering menu to celebrate, our team will take the lead in planning your ideal Playa del Carmen beach wedding. Fill out an RFP today to celebrate your love in the sun and sand at Mahekal. THANK YOU MAHEKAL BEACH RESORT! "Our wedding experience at Mahekal Beach Resort was far beyond what we had expected. 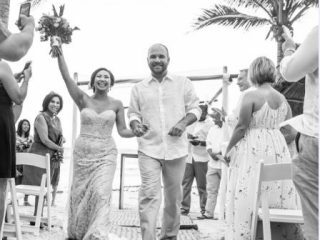 Our wedding day was PERFECT and the stay at Mahekal was wonderful for us and all of our guests. We can’t say thank you enough to Karla and the wedding staff at Mahekal for making our day a truly stress-free and wonderful day! At first visit to Mahekal – we knew this place is where we wanted to have our family and friends come witness our day. The beach resort was nice and cozy but was highly maintained. The biggest draw for us was the proximity of the resort from the beach (my want) and the heart of Playa del Carmen – 5th Avenue (my husband’s want). The staff was accommodating and super friendly and we never felt over crowded or unattended (there were 3 other weddings going on at the same weekend!) From Vendor recommendations to planning and budgeting, Laura and Karla was there every step of the way answering questions and reassuring me of the tiniest details! THANK YOU AGAIN and we had a BLAST! I definitely highly recommend this to anyone who is thinking of having a wedding in Playa del Carmen! We definitely will be back to stay, hopefully every year! "